Air-BNB and similar sites are growing in popularity mainly because they are making travel cheaper and, in a lot of cases, more comfortable. In fact, many people are purchasing and renovating apartments simply for the purpose of renting them out to travellers. Such is also the case for the Position Collective design firm of Hungary. 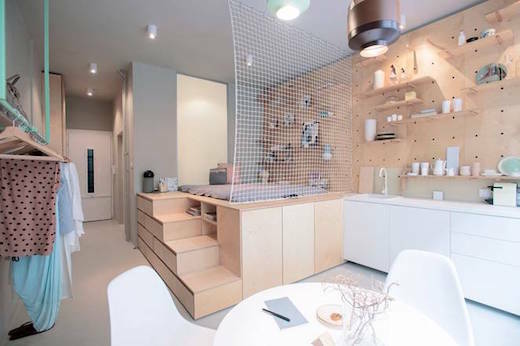 They have renovated a small apartment into an airy, light filled and quite functional living space. 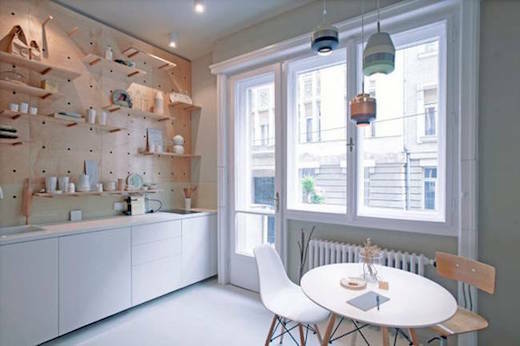 The apartment measures just 323 square feet (30 square meters) and is located in Budapest, Hungary, which is fast becoming a very popular travel destination in Europe. Despite the small size, the apartment is very functional and modern, and should appeal to a variety of travelers’ tastes, from casual tourists to digital nomads. In fact, I wouldn’t mind living in it full time. The apartment features a full-sized kitchen, with ample counter space, and a dining area at one end. One of the walls is covered in plywood paneling, while the rest is simply painted, white which increases the sense of spaciousness. 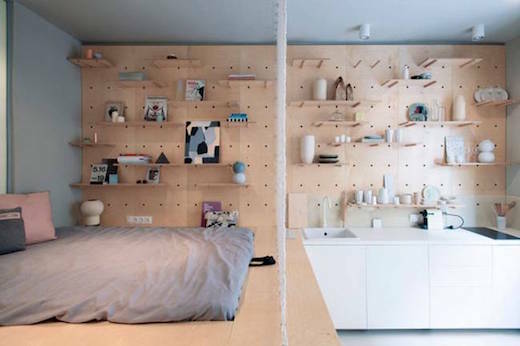 The plywood part of the wall is a lot like a giant pegboard, and features lots of shelves, which are fully configurable and adjustable via clever inserts. 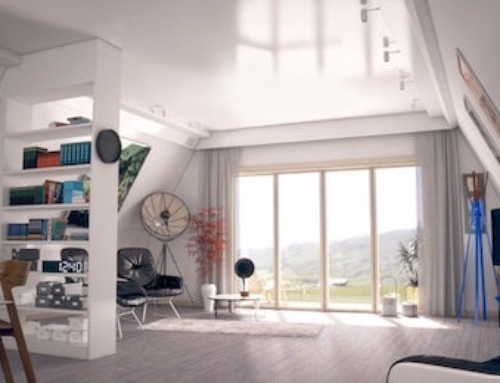 The bedroom forms the centerpiece of the apartment and is comprised of an elevated platform also made of plywood. This area is accessible via stairs, and there is ample storage space built into the platforms under it. The bedroom contains what appears to be at least a queen sized bed, while there is a net curtain separating it from the kitchen. This is more for design purposes than any real privacy though. 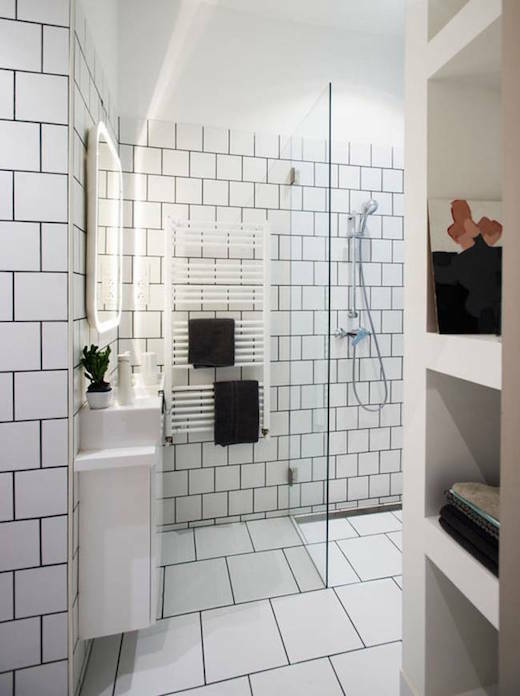 The bathroom is well sized too, and is equipped with a shower, toilet and sink. It also features a sandblasted glass window, which lets in plenty of light, but still offers privacy. There does not seem to be a lounging area in this apartment, but it does feature a balcony, which offers a great view of the city.